Many a critic will discuss a game’s verbs: the things you do in the game. That’s too general an approach for me. 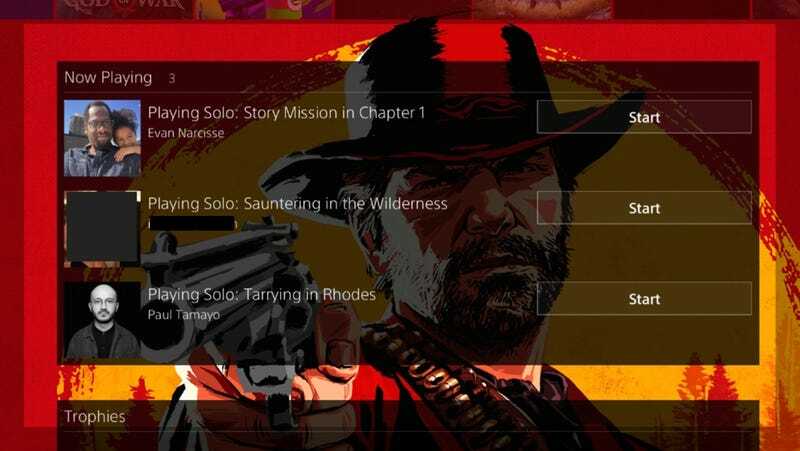 I’m here to praise Red Dead Redemption 2’s present participles. If you’ve played Red Dead Redemption 2, you may have not noticed them. You may have not noticed them because you can’t see them while playing Red Dead Redemption 2. Unlike the Rockstar western’s excellent implementation of deep snow, its instructional take on hair growth and its generally compelling depiction of a crumbling micro-society, this new Red Dead’s superb present participles appear outside the game. This is, of course, a tiny thing, the kind of added touch that shows a game has been made with extra resources and attention to detail. “Sauntering” and “Moseying” are good words. They are also great words to describe the languid pace that one commits to when playing Red Dead Redemption 2. Rockstar games have long been known for having tiny, unexpectedly well-crafted touches. Some are in the game. But one of my favorites, this time, is outside of it.